Swan Flight mic case - holds 15 mics with other storage area. 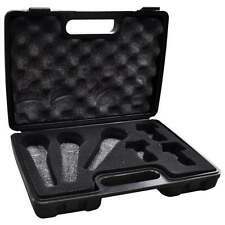 Soundlab Black ABS Microphone Carry Case for Three Mics and Holders Foam Filled. SoundLAB Empty Case to House 3 Microphones & 3 Microphone Holders. Tough ABS Casing. Designed to Carry Three Microphones & Holders. 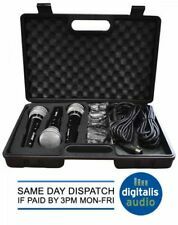 Microphone kit featuring 3 good quality plastic dynamic microphones with holders and 2.8m XLR leads in a robust egg foam lined carry case . With an extended frequency range the product is ideal for male and female vocals or for instrumental applications and is equally suited for karaoke or Home use. In stock ready for immediate dispatch with full VAT receipt. 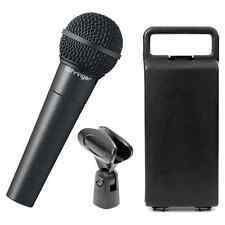 Shure SM57 Instrument Dynamic Microphone With Case. Condition is Used. Dispatched with Royal Mail 2nd Class. Behringer XM8500 Ultravoice Dynamic Handheld Microphone. The Behringer Ultravoice Dynamic Handheld Microphone is a huge favouirte among all vocalists including several professionals. This premium microphone is manufactured in Germany therefore, explains its clever and impressive build. If you look at the tech spec they are incredibly close to an SM57 & at fraction of the cost, worth having a couple of these in the kit box even if they are just as spares. though if you want a 57 & don't have the cash to spend, this is the one that will do the job. The microphone has been checked on my mini-mixer for speech quality and sounds perfect. The condition is fully detailed above. Condition is Used. Genuine reason for sale. Designed to hold 1 x handheld microphone and cable/clip. Single Empty Microphone Case. The Soundlab G148KB vocal mics are supplied with 3 x 2.8m XLR leads, robust mic holders and a carry case. The high-quality dynamic mics are compatible with virtually any PA speaker. Microphone Stands. For disco lights, cds or whatever you want it for! Black Aluminium Flight Case! Weight: 3kg. Internal Size. MXL 770 Large Diaphragm Studio Condenser Microphone Shockmount, Carry Case Also this contains a TISINO XLR Female to 3.5mm jack, Neewer 48V Phantom Power supply with the adapter and XLR Female to Male cable. Condition: Nearly brand new, only had everything for 2 months. All works with no damage to cables or parts. Reason for me selling is that im upgrading microphone and changing my studio so I dont need extra cables lying around All together its worth around £120 - £130 Message me for more info or pictures of the products. Thanks P.S Sorry for relisting, had to change the price. Sennheiser freePORT Wireless Microphone System in Case. And now the boring bit if you would like to more information the owners manual can be downloaded from. Lockable flight case with pre-diced foam insert for. carry handle and lockable catches via the supplied keys (2 keys supplied). Microphone Flight Case. The outside of the case features aluminium extrusions, a tough diamond patterned finish. Behringer B-1 Condenser Microphone w/ Case, shock mount, and pop filter. Condition is pretty much new, only used once or twice for testing a home studio rig.